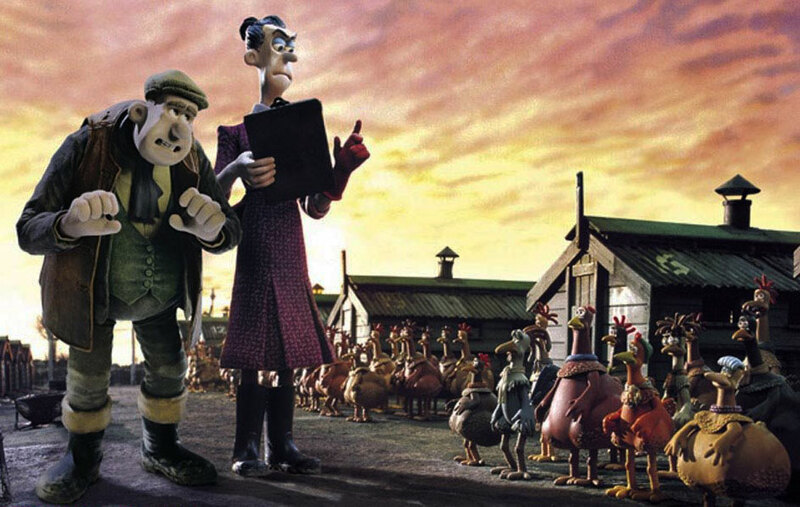 I’ve been eagerly awaiting this week’s Hit Me with Your Best Shot as it is an animated film, and one that I happen to love at that- Aardman animation’s 2000 Chicken Run. 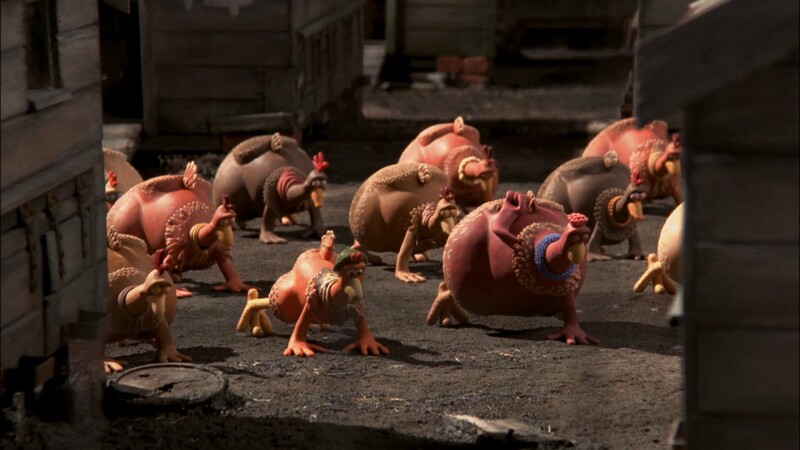 I know this is about chickens instead of turkey but it has become a bit of a Thanksgiving tradition at my house to watch Chicken Run. 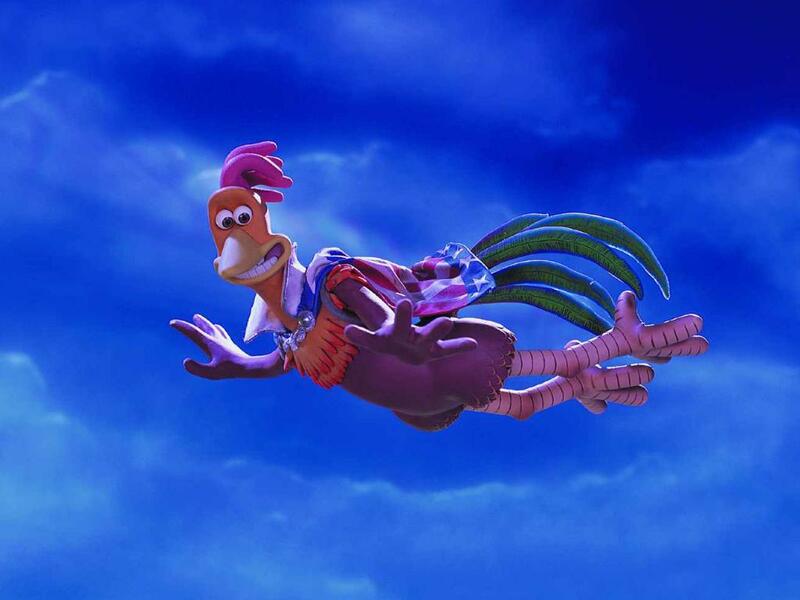 It certainly beats Free Birds as a Thanksgiving film and I don’t think there are any other movies about poultry. Am I wrong? I watched it again today and was delighted all over again. This will be more like a traditional review from me since animation is my blog focus but at the bottom I will have my best shot like normal. 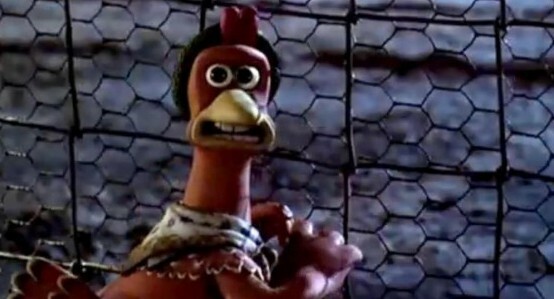 If you haven’t seen it, Chicken Run is a claymation, stop motion animation take on a prison escape movie like The Great Escape. It focuses on Ginger (Minnie Driver), a plucky chicken at Tweedy egg farm who refuses to be satisfied with a life at the farm. She is really the only intelligent chicken in the lot. Well, there is the braniac chicken but she’s the only one that seems to understand what they are up against. The design of the farm is brilliant with hen houses that look like the cabins of the Great Escape. All of Ginger’s attempts to escape feel very reminiscent of those pictures. I like this shot the bunk has 17 on it like Stallag 17, another famous prison war movie. 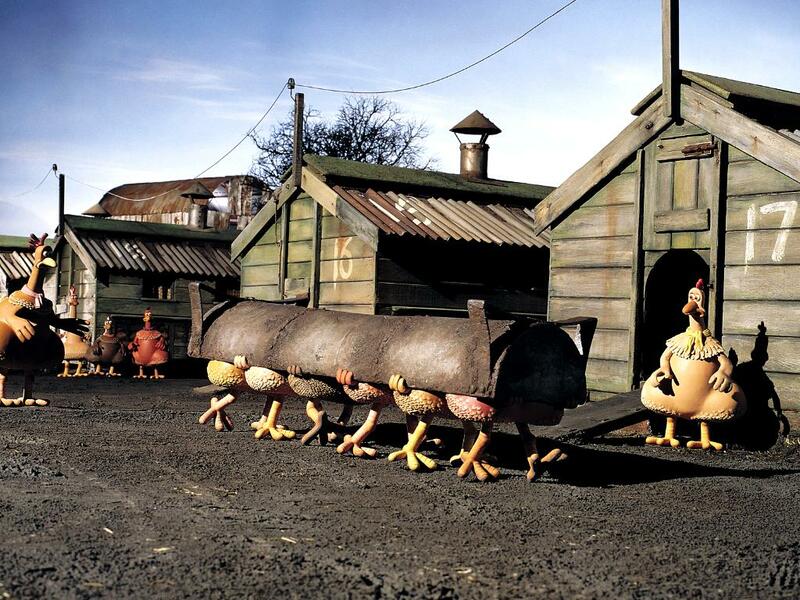 The chickens end up failing in all of their attempts and Farmer Tweedy gets suspicious the “chickens are organizing!” which his wife Mrs Tweedy thinks is insane. She’s the main villain of the picture and a lot of fun in a Cruella Deville type fashion. Her dream is to turn the chickens into pies and she buys a giant manufacturing machine to make the pies. With the purchase of the new machine Ginger is about to lose hope when a rooster named Rocky comes flying in to the farm. Ginger knows he is from the circus but thinks he has somehow learned how to fly. To Ginger this could be their salvation. Perhaps he can teach them how to fly! Of course what he isn’t telling them is he is shot out of a canon and can’t fly, but he needs to hide out from the circus while they are in town so he plays along and begins training them on how to fly. This involves a really fun montage of chickens doing pushups and the like. There’s also an amazing sequence where Rocky and Ginger get caught in the pie making machine. It’s in the spirit of Indiana Jones and adventure movies with all kinds of obstacles to conquer. 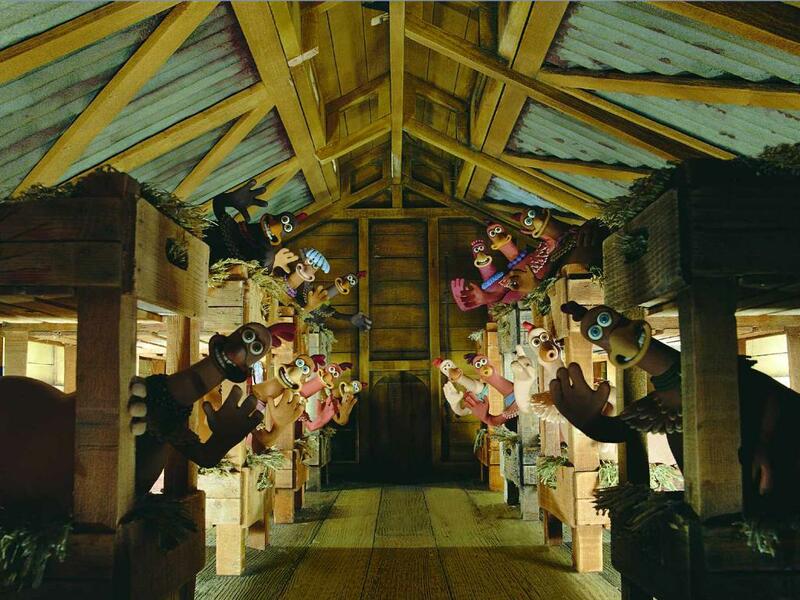 It blows my mind when you watch this scene and remember it is all done with moving clay figures inch by inch. The ending plays out in a fairly predictable way for this genre of movie but Mrs Tweedy is pretty scary, maybe too much for some kids? As is always the case it depends on the child. Thing that makes this movie special is the writing. It is funny throughout. Not just the homages to escape movies but the dialogue is witty and will make you laugh. 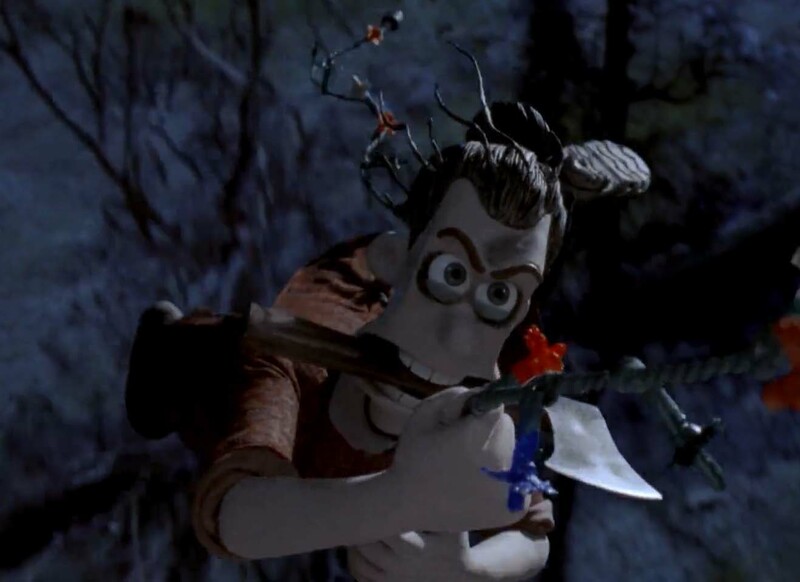 Pter Lord and Nick Park bring the same type of humor we got in Wallace and Gromit with perhaps more of a visual component added in. (Karey Kirkpatrick is the screenwriter with a story by Lord and Park). All the other aspects are very strong including great music by John Powell and Harry Gregson- Williams. I particularly like “Flip, Flop, Fly” a great swing number! Plus, I like the way the chickens look. I like the smoothness of the skin and the feather collar and feather underneath. To me it is a pleasing design. All the sets are incredibly detailed and intricate especially when you consider they are all done by hand (stop motion animation is unbelievable). I always say when I judge a comedy the number one factor is- Did it make me laugh? 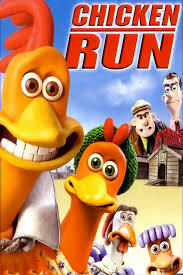 The answer for Chicken Run is Yes! I laughed back in 2000 and I laughed today watching it. It’s a delight in every other way so I can ignore a somewhat predictable story. For me it is a big win! Hit Me with Your Best Shot can be difficult because do you pick the shot that gave you the most pleasure or the one that looks the best? The two are not always the same. My favorite joke in the movie is when Ginger tells the girls about the pies and Babs (the knitting chicken) says “I don’t want to be a pie. I don’t even like gravy”. I don’t’ know why but that cracks me up every time. But the shot of her saying that line isn’t that great. I will go with the line just after it and you can see the mayhem on the part of the hens at this news. 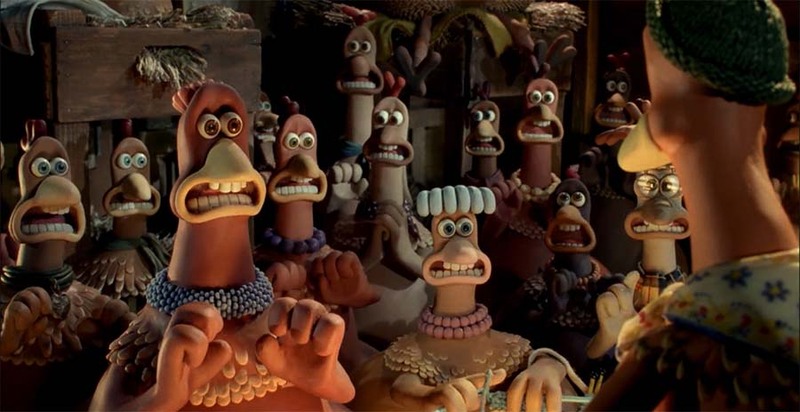 I think it is emblematic of the entire film, the claymation style and I love the expressions on the chickens faces. So great! I’ve never seen this all the way through. Which is funny because my grandparents used to raise chickens on a farm out in the country, and I always got the impression this movie was considered one of the classics by them. Oh I think you’d like it. At least I do. It’s not very long so not much of a sit-through. I saw this film for the first time in a while back in 2012 when I got my friend Ian and his family acquainted to it (that had been their first time seeing it surprisingly). Anyway, I enjoyed it as much, if not more than in earlier years. They also enjoyed it even though none of them seemed to like it as much as say Flushed Away or something like that. Anyway, great review! And I didn’t know Minnie Driver played Ginger as well. How interesting, considering that she also did the voice of Jane in the Disney version of Tarzan, which oddly enough came out the year before. Anyway! Why then does it say on Wikipedia hat an actress named Julia Sawalha voiced that character then? Anyway, not to nitpick, bit I’m just saying. You are right. I messed up. I always thought it was Minnie Driver and I guess didn’t double check that. Sorry. They do have very similar voices! Oops. It’s one of my favorites too! I was so close to putting it in my top 50 ranking but went with Wallace and Grommit instead. But I love it! No worries! I may put this in my top 50. ButnI guess we may see soon, eh? 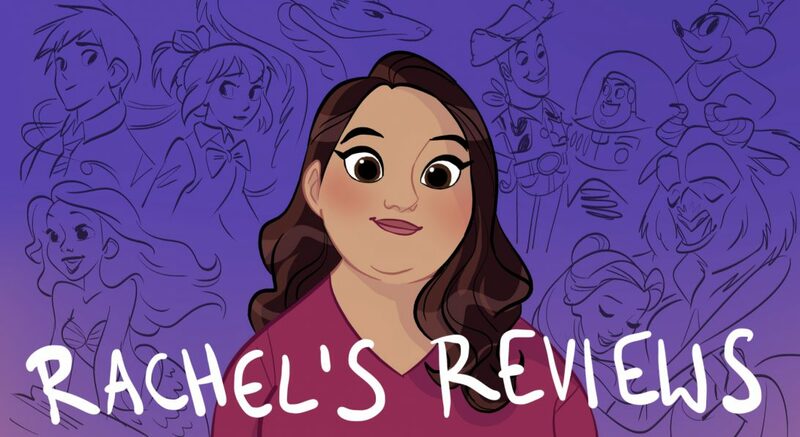 Pingback: Dreamworks 12: Wallace and Gromit: The Curse of the Ware Rabbit – Reviewing All 56 Disney Animated Films And More! Pingback: Early Man Review – Reviewing All 56 Disney Animated Films And More!